"Don't Look Behind You" was originally broadcast on 27/Sep/1962 as part of the first season of The Alfred Hitchcock Hour. 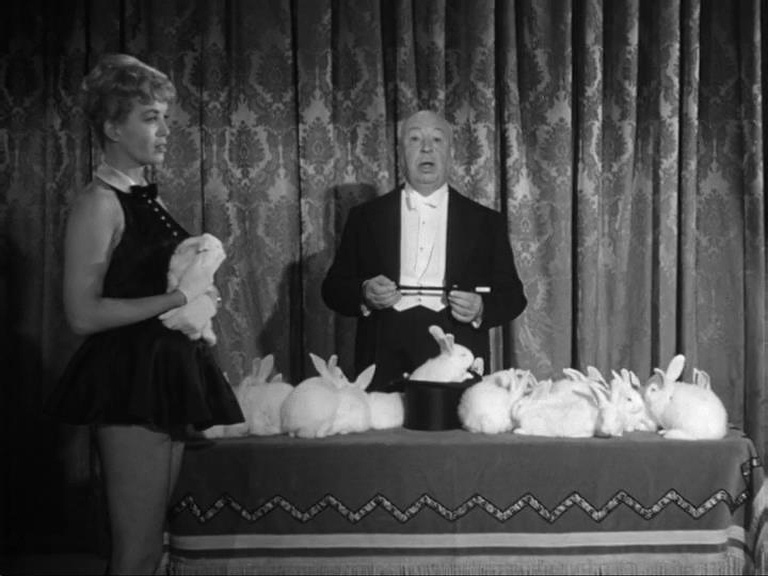 Hitchcock is stood on a small stage, dressed a magician and with a glamorous assistant. 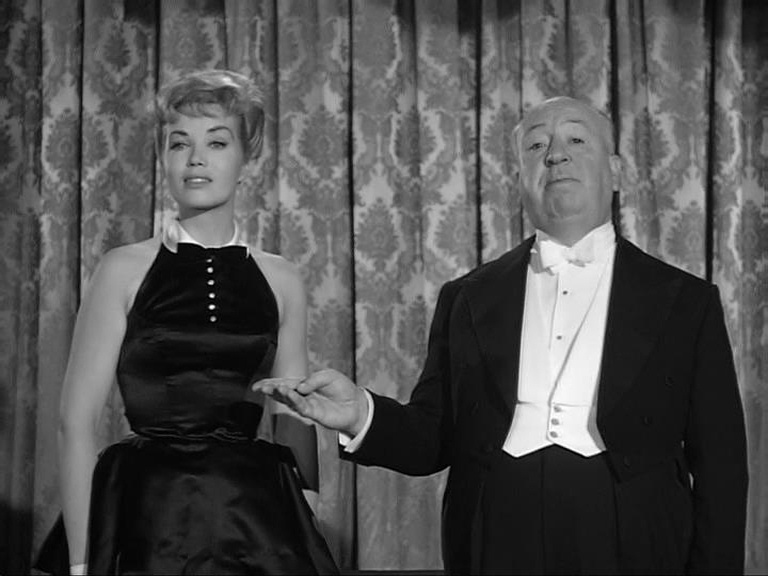 Good evening ladies and gentlemen, and welcome to "The Alfred Hitchcock Hour". I trust you will excuse my startled expression but this [points to assistant] is what I just pulled out of my hat. It's rather a shock when one is expecting a rabbit. However, I suppose it isn't as traumatic as it would be if I were expecting her and got the rabbit. Since my hand is not quicker than the eye, I think she will be quite useful in diverting your attention. This evening, I shall attempt feats of legerdemain. One is to make an hour disappear with your realising it. That will not be easy considering this first minute. I warned you not to stay so long. You can hardly expect rabbits to simply sit around waiting for a station break to end. Now it is time for the second half of our story — perhaps after that, there will be time for a few tricks. Next week we shall be back with another story. Now there's just time enough for my escape act. 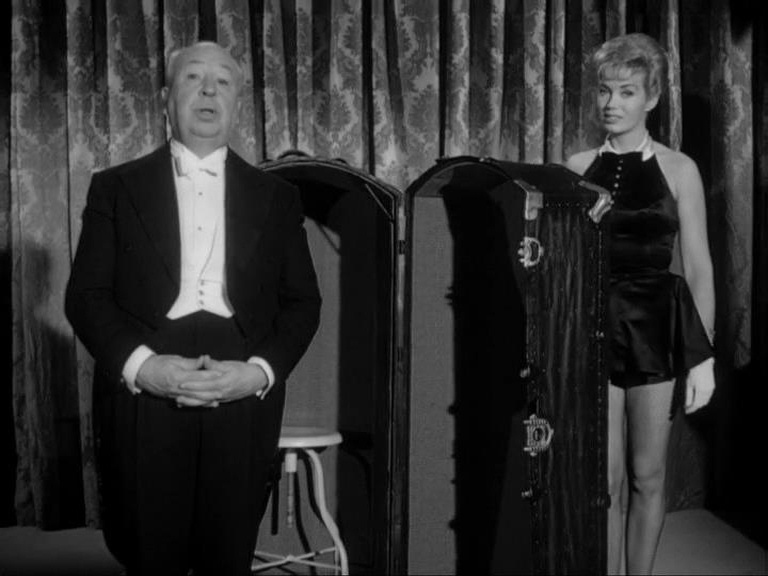 Hitchcock climbs into a large suitcase and his assistant locks him inside. She turns the suitcase to reveal a sign saying "Do not open until Christmas — Season's Greetings". The assistant says "Good night" and exits wearing Hitchcock's top hat to the sound of sleigh bells.